It’s hard not to compare Anna and the Swallow Man by Gavriel Savit with Marcus Zusak’s The Book Thief. Both novels have omniscient narrators. Both center on the experiences of a young girl living in Nazi territory during war World War II. Both girls are without parents. Each girl has a wise male mentor watching out for her. But while the young book thief is gutsy and indomitable, Anna is timid, tentative, and innocent. Obedient and malleable, seven-year old Anna follows the Swallow Man around the countryside after he finds her alone, cold, and hungry on the streets of 1939 Krakow. Her father, a professor of linguistics, has recently been taken by the Gestapo as part of the Sonderaction Krakau, a removal from that city of all intellectuals and academics. Anna has no understanding of where her father has been taken, or why. She is innocent about life and even about war. It is her innocence that makes Anna such a winsome heroine and Anna and the Swallow Man such a compelling read. Some of the story’s tension derives from readers understanding what Anna does not: There is much out there on the road to fear. Perhaps even the Swallow Man himself. That he is on medication for an unknown ailment, lends the narrative the constant foreboding of a ticking time bomb. Until the bomb detonates. The Swallow Man’s identity remains a mystery throughout the book. This adds an other element of danger, one that will both pull readers along and slightly puzzle, if not annoy. Even what is eventually revealed about the Swallow Man is quite cryptic. Savit treats readers to lyrical prose, frequent philosophical musings, and the occasional luminous, achingly beautiful scene between Anna, the Swallow Man, and Reb Hirschl, who later joins the duo on their journey. The inclusion of Reb Hirschl offers Savit (and readers) the opportunity to examine the different sides in war and the nature of friendship. This a true road story (even their secret language is called “Road”) and the narrative unfolds in the same convoluted, circuitous path as that taken by the travelers as they cross borders, enter and leave towns, staying nearly continuously on the move. As a result, the pacing of the novel feels timeless. Has a week passed? A month? A year? The story unspools in an almost dream-like manner, and one gets lulled into a sense of near ennui. The action then, when it comes: Anna hearing the nearby screams of slaughtered citizens; the trio discovering that they’ve wandered behind the frontline; Anna, alone, encountering a strange man in the woods, is as unexpected and horrifying as events are in a time of war. Savit’s philosophizing is provocative, although some passages are so dense as to be nearly inscrutable, and younger readers will likely need help deconstructing them. Savit’s views on faith, the requirements for survival, and the necessity of good and evil in the time of war, flow more seamlessly when presented through dialogue than by the narrator. A thorough appreciation for this book will hinge on a solid understanding of this time in history. Such references as “high period for the ghettos” may require some unpacking for younger readers. The ending, true to form, offers little resolution and no true winners, but just enough possibility to uplift. 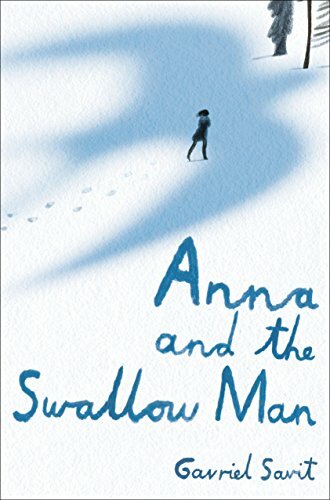 Readers of all ages will find much to ponder in Anna and the Swallow Man, a novel about the difference between being lost and not being found, and the power of language to reveal who we truly are.